Removing Roof Stains-Louisville-Kentucky: What do you know about Roof Algae and the Proper way to remove it? What do you know about Roof Algae and the Proper way to remove it? There is a lot of misconception when it comes to unsightly black streaks on asphalt shingles. Perhaps you have seen such black streaks on roofs, they normally first start to appear on the north facing slopes of the roof. The north side is the side with the prevailing amount of shade and moisture. Once the algae lands on the roof it does not go away or ever get any better. It will begin to feed on the shingles and will spread over time eventually taking over the entire roof. Roof cleaning is a great service to help with this problem of roof algae. When done right, roof cleaning will restore the roof’s appearance, increase curb appeal and value, and will stop the damaging effects of the roof algae. The proper method is a low pressure chemical application which is recommended by the major shingle manufacturers. A pressure washer should not be used because the excessive pressure will damage the shingles. They also recommend a bleach based cleaner, it is safe to use on the shingles and it will kill and remove the algae properly. No other chemical should be used, only bleach according to the shingle manufacturers such as Owens Corning. Not taking care of roof algae can lead to increased home and cooling costs and will deteriorate the shingles. Roof algae will definitely lessen the longevity of your shingles because it does not allow the shingles to reflect heat like they need to. Years of life can be shaved off the roof when roof algae is left untreated. It is like anything else that is exposed to the elements. For example, if vinyl siding is neglected it can also accumulate mold, mildew, and algae and if left untreated it will lessen the longevity of the siding. Roof’s are the same and when they get dirty or get infected by roof algae, they just need cleaned. It is not rocket science but I am amazed at the amount of homeowners and even roofing contractors that are not aware of what roof algae appearing as black streak are. I have heard all kinds of explanations of what these unsightly black streaks are. I’ve heard it said they are water marks, nail rust, the tar paper showing through, and even tree sap. None of these are true, it is an airborne algae technically called Gloeocapsa Magma. It gets on the roof, survives by feeding on nutrients in the shingles, and is spread down the roof by rain creating the black streaks. It is no different than mold on vinyl siding, or mildew on a wooden deck it can be cleaned like anything else. And like noted, the proper roof cleaners and cleaning methods are recommended by the major shingle manufacturers whom recognize roof algae as an ongoing problem. Educate your family, friends, and neighbors as to what this airborne algae is because it can jump from roof to roof. This is why you’ll see many roof’s affected in an area and none affected in other areas. 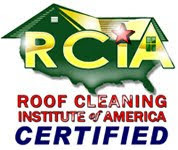 In the south your the climate is more prone to grow algae and mold, roof’s are cleaned almost yearly. In the more northern states the algae is a problem but once a roof is cleaned properly it will stay clean for a minimum of several years. But because roof cleaning is not as popular in the northern states it seems that not many people know that it even exists nor what those black streaks on roofs are. Help spread the truth about black roof algae streaks and roof cleaning. Call for FREE no obligation Certified Non-Pressure roof cleaning estimate from Qwik Roof Cleaners, Louisville Ky.---502-773-1730 "Certified Roof Cleaning Professionals"